A good foot massage can really help one relax, particularly having been on your feet all day long. 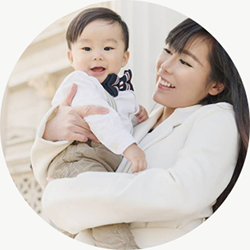 I was running around shopping for Lunar New Year goodies in the morning and then I zipped off to The Clifford Clinic for a session of AGNES ACNE Treatment in the afternoon. The invitation to try out the foot massage at Feet Haven located along East Coast Road was a welcoming relieve for my two tired feet! Feet Haven has a no-frills and and rustic décor. The shophouse unit is decorated in a vintage old school style with local art works hanging on the walls. Customers are greeted with a row of comfy leather recliner chairs all facing the same direction (perhaps to prevent the awkward moment of staring at a fellow customer in the face when having your foot massage). Two massage beds are placed at the corner of the elongated room, beside a portable massage chair. The client basically chooses the length of the massage and then you are allocated a therapist and a chair. When I visited today, we were greeted with male massage therapists. If uncomfortable, please check if you could put in a request for a female massage therapist. After soaking my feet for 5 minutes in a sea salt foot bath, my therapist started massaging my feet. One thing is for sure: he was taught at the 'no mercy' school of foot massage! My massage therapist really had amazingly strong hands with a very firm pressure and a variety of strokes. He ensured that all the areas of my foot was targeted. 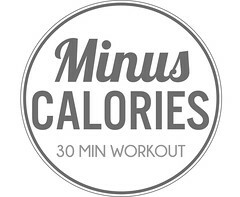 Based on my reactions to the different targeted areas, he gave me information on the state of my body health. According to him, my body composition was "heaty", and I had a weak digestive system (胃). During the massage, I felt that he knew how to capture the right dosage of pressure while ensuring that I remained relaxed. Point to note though, that this is definitely not a place to come to for the trendy ambience or "soft" massage. But if you're looking for some restorative relief for your tired and aching feet then look no further! The session truly made me feel so relaxed and my feet really felt lighter. The whole session was rounded off with some hot tea served. All the therapists were busy upon our arrival. There were quite a few clients waiting for their turn. 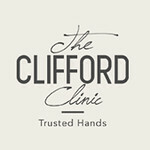 I went to The Clifford Clinic for my second session of AGNES ACNE TREATMENT. The therapist working his magic on my feet. 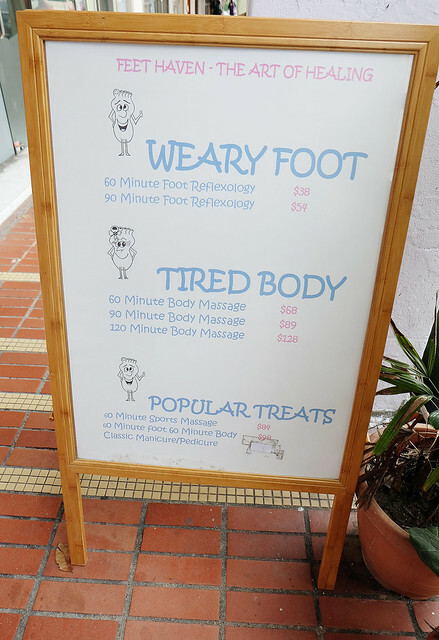 A board showing the price list of the treatments available at Feet Haven Katong. I would definitely return to Feet Haven again with my husband and mummy in tow! I enjoyed the foot reflexology session very much and my therapist was very friendly and humorous. We talked and joked while he worked on my feet. The effects of this foot reflexology session was similar to the expert therapists I experienced in Bangkok. The price is reasonable and I felt that I was in good hands all through the foot reflexology session. My therapist ensured that I was relaxed and comfortable.